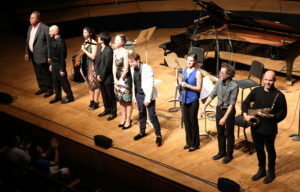 This year’s Festival of Contemporary Music at Tanglewood (in Lenox, Massachusetts) was curated by three youngish stars of the new music community: pianist Jacob Greenberg (ICE), cellist Kathryn Bates (Del Sol Quartet), and violist Nadia Sirota (Q2, ACME). 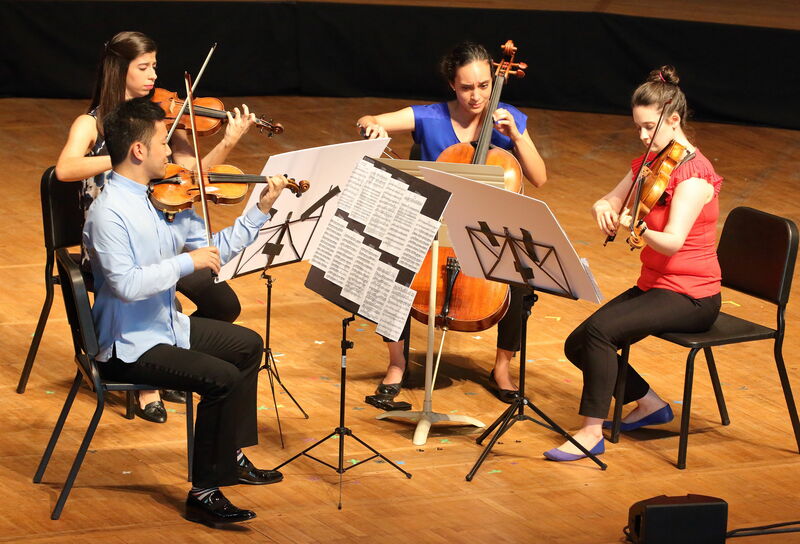 Each planned a chamber music concert, consisting of commissioned new works and contemporary repertory selections. The curators combined forces with the BSO in selecting pieces for the festival’s finale, an orchestra concert conducted by Stefan Asbury and Vinay Parameswaran. 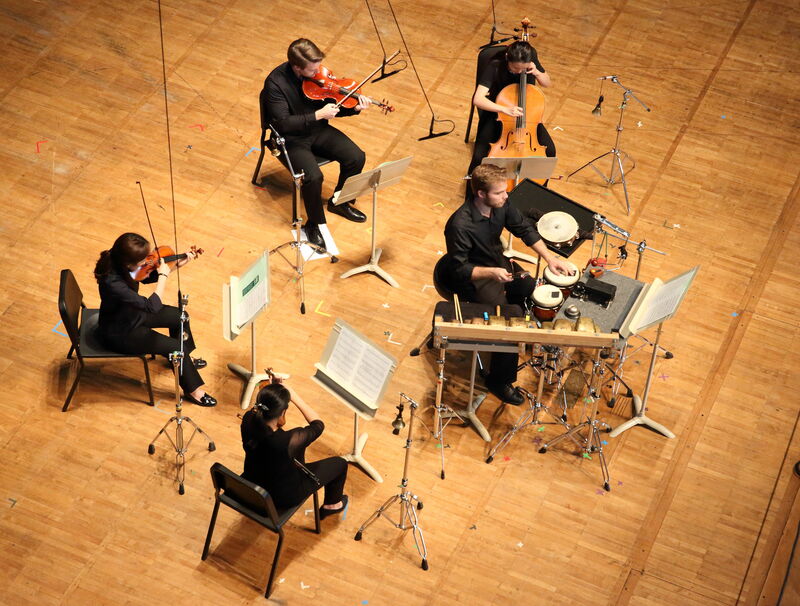 Commissioned works included vocal pieces by Nathan Davis and Anthony Cheung, a string quartet (with copious use of water-filled glasses and glass bowls) by Kui Dong, and Clip, a chamber ensemble work by Nico Muhly (for which I contributed program notes). These showed a diversity of musical approaches. Davis and Cheung took postmodern textual compiling as the jumping off point for stylistically varied and technically demanding singing. 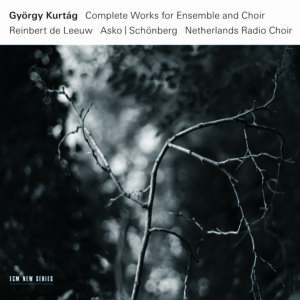 Dong revelled in glassine textures, both in the strings and with the water glasses themselves, while Muhly presented one of his most rhythmically intricate works to date, in places extending the language of post-minimalism towards the polyrhythms of late modernity. A standout on the concert curated by Greenberg on Thursday, August 10th was Columbia University professor George Lewis’s first appearance at Tanglewood (at age 65). Noteworthy for his work with AACM and a catalogue of compositions encompassing facets of concert music, jazz, improvisation, and electronics, Lewis was represented by Anthem, a 2012 piece originally written for Wet Ink Ensemble. 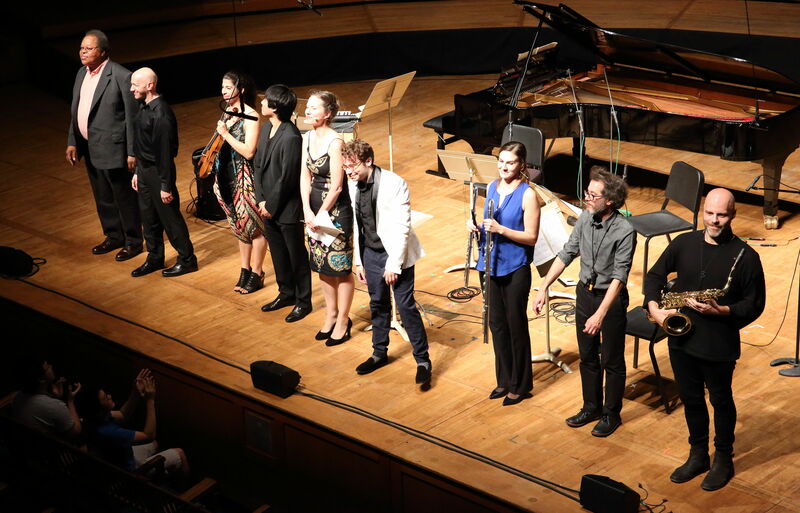 At Tanglewood, Wet Ink’s vocalist Katie Soper, herself a prominent and creative composer, delivered a supersonic performance of a part written in Sprechstimme to Lewis’s own text about TV talking heads and subversive political commentary. Teddy Poll conducted, Greenberg contributed electronics, and the rest of the players, to a person impressive, were mostly guest musicians from ICE. Imaginatively scored and surpassingly energetic, Anthem was a rousing closer to FCM’s first evening. Friday afternoon featured a program of string quartets curated by Bates. 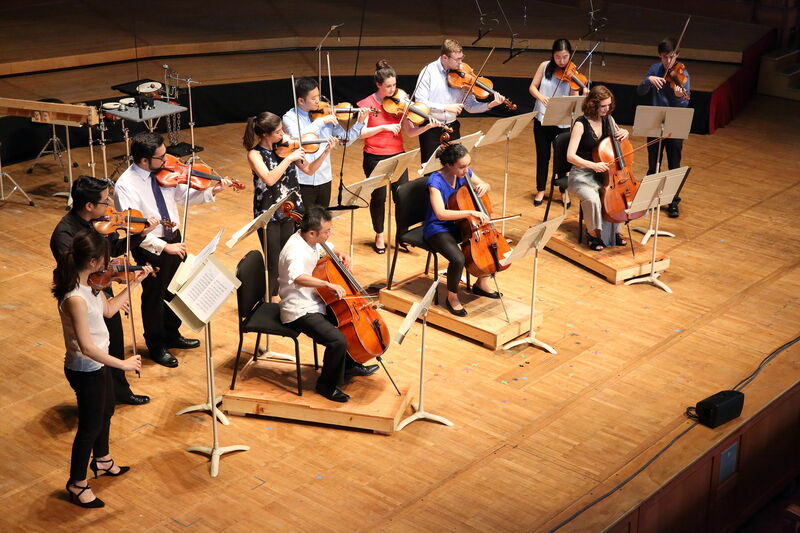 A detailed and fine-tuned performance of Ben Johnston’s microtonal Fourth String Quartet by the Fromm Players (for which I was fortunate to contribute program notes) loomed large, but Bates introduced other fine pieces to Tanglewood audiences as well. 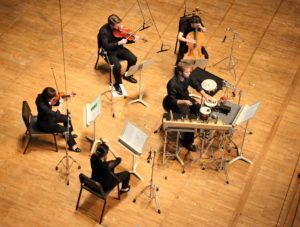 Croatoan II for string quartet and percussion by Moritz Eggert, supplied the proceedings with a welcome dose of humor, treating the mystery of a disappearing colony of early American settlers with more whimsy than tragedy. Percussionist Tyler Flynt, using what Bates described as a “suitcase’s worth” of hand percussion instruments, made the quick changes both in tempo and instruments seem effortless. Rene Orth’s Stripped (2015), a piece written in memory of the trumpeter Alex Greene, her Curtis classmate, began with noise-based sound effects and traversed an imaginative pathway to soaring harmonics. Although it didn’t quite gel in the Tanglewood performance, Terry Riley’s G Song is an attractive deployment of all manner of scalar patterns and jazzy cadence-points (look for Del Sol Quartet’s next CD to hear it more authoritatively rendered). 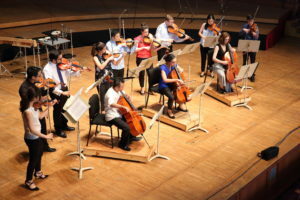 Violinist Cameron Daly and cellist Chava Appiah performed Lei Liang’s Gobi Canticle, a piece that incorporates material and techniques from Mongolian string music. Liang visited the Nei Monggol region in 1996 to learn more about its music-making. This is deftly demonstrated in Gobi Canticle, which is at turns gently lyrical and boldly dramatic in cast. I was most pleased to be introduced to the work of Jack Body (1944-2015), the recently departed New Zealand composer whose works synthesize ethnomusicology and composition. The wonderfully fleet and attractive Flurry (2002), in a version for three string quartets, opened Friday’s concert. Led by Bates, this all-too-brief work was immediately encored. One was glad to have the chance to hear it again and, unlike some encores, the performance was just as strong the second time around. Later this week I will be writing more about FCM, as well as the BSO concerts that coincided with the festival. The article will appear on both my blog and Sequenza 21.